Motherhood is the most beautiful yet a challenging journey for women! Everything changes for a woman once she enters motherhood physically and mentally. If pregnancy is a challenge, post-pregnancy is not a cake walk either! That is when we need to put in all the hard work to redeem ourselves and get back to being our old self, all this with a baby on our side! For women living abroad like me, it is a bigger task. So I thought I would pen down my experience of self-rediscovery in a blog so that it could help anyone going through what I went. It all started off right from the time I got conceived. Even before I had my baby I did workout but nothing intense, as I felt I was never overweight in my teenage (I did aerobics (Jane Fonda) and yoga which helped me shed those extra calories). During my early pregnancy days, I had a lot of plans to be energetic, do yoga, do some exercise. I used to watch fitness videos and tips to stay fit during pregnancy but when nausea hit me I just could not think of anything else. To spend my day normally and to keep some food inside was a big task for me. Later during my 7 – 9 months of pregnancy, I did some upper body exercises and basic yoga to keep myself active but nothing went according to my initial plan. Right after my delivery, I was around 156 pounds (70kgs) which nearly frightened me since I had never seen myself with that kind of weight before. But weight was the last thing on my mind at that point of time. I had so much going on around me. Suddenly life had a new routine overnight. I was blessed with a baby boy, Ishaan. I was enjoying the euphoria and I was happy to let everything else take a back seat for a while. I had to feed him and take care of him along with taking care of myself. Any kind of delivery will take a toll on a woman’s body and it is important to let it heal. I personally felt my body took more time to heal after the C-Section than the time required for most women which is 6 weeks. It took a good 8-10 week’s time for me to get back to normal and to get a hang of feeding my baby (Now while feeding your little one I’m sure many moms hear suggestions from a lot of people, one common suggestion will be to eat white bread and milk! Which I refused to believe due to lack of scientific knowledge and all it really does is add loads of calories which is not good for you. I ate very normal food and was able to feed my baby for good 9 months). Pictures: Pre-pregnancy, Pregnancy and Post pregnancy. Finding my stride after pregnancy was not a walk in the park! I started going for small walks when I was 5-6 weeks postpartum. I was not healed completely but I was sick of sitting at home all day. I barely could walk properly with that kind of weight on me and thanks to the searing pain I felt every time I walked. It might not be the case with everyone especially working moms, they are blessed in a way that they have to push themselves to work, like it or not. I used to go for a walk around my community and during that time I couldn’t even imagine running with that body weight. I remember panting just after few steps. Trust me, I felt extremely heavy. Days passed by, weeks passed by and Ishaan turned 5 months old already and then it hit me that I have to lose the extra weight before Ishaan turns one. I had to swap real wardrobe to stretchy pants and maternity clothes and sometimes even they seemed a little snug. I could not recognize myself in the person I was at that point. I had to do something but had no clue where to start. I read blogs, I spoke to people, I tried to find some motivation, but it simply became impossible to get myself started! With sleepless nights and exhausting baby work and with the heaviness in my body it just wasn’t easy to pass the day. It took another couple of weeks of self-pity before I made a decision to continuously hit the gym for 1 full month without looking at the weighing scale or mirror. As much as I would love to say I immediately got back to the routine and lost weight instantly, that was not the case. I made a calendar for myself for one month. I used to burn at least 300 calories during every workout (typically elliptical workout with few stretches) and sometimes I did that twice a day. There were days when I burned around 500-600 calories. I literally lived in my gym clothes all day. Thanks to my grandmom who was with me in the US during this time. She was my constant support. I was still feeding my baby during this time but I tried to maintain a diet. I avoided eating oily or any processed food. I cut down on rice completely, I included quinoa in my diet which I was used to even before my pregnancy. I drank hot water with lemon and honey in the mornings. I ate roti and curry in the evening. And fortunately, I could still feed my baby. They were times when I used to finish workout and sweat like crazy but when I looked into the big mirrors in the gym, I found absolutely no difference. I felt like I was not making any progress. But I kept confidence in myself to never give up and finish what I started. Everything was going fine and even if I didn’t lose a lot of weight, I felt good inside (endorphins kicked in I guess). I was happier than before. Just then, unfortunately, I had a foot fracture. This was the hardest part. I became immobile and couldn’t work out for 6 weeks. Since I worked out for 28 days at a stretch, I terribly missed that time at the gym and was forced into being a couch potato again. The days I spent sitting on the chair for hours together made me realize how precious time is and how well I could use it. I was waiting to get back on my feet. I wanted to run nonstop for days together, that was my inner feeling. I got better and I left for India for 2 months where I planned a workout schedule but ended up doing nothing. As I returned to the US (this time I have no help and I had to take care of Ishaan and home all by myself) I decided to stop wasting my time and started off with my workouts. I started hitting the gym again, continuously this time for almost 2 months and more. I started running outside once the weather got better. I have run before, but honestly not more than 5km at a stretch and not without stopping in between and walking. I was that bad. So, I started off with practicing 5km runs nonstop every day for a week and a half targeting 50kms and I did it! It did not matter if it was a rainy, sunny or a snowy day. That was when I got a lot of confidence and I went ahead and registered for my 1st half marathon (13.1miles, 21.09Km) in April 2017. I was still skeptical and nervous about it, I couldn’t sleep the night before my run as I was super nervous. But, I did it! I ran 10kms nonstop and a mix of walking and running after that to complete the half marathon. It took about 3 hours to complete. It was overwhelming to get my first medal home and I felt proud to see myself complete a half marathon! That was when I could feel myself really light on my upper body and started to lose weight on my legs and inner thighs as well. I registered for another half marathon the next month. I practiced again this time, not 50kms, but on and off runs and going to the gym helped. I still took 3 hours to complete the run, which according to me was still fine. Now I have reached to 2.29.00 minutes to complete a half marathon. About marathons, all I have learned from my experience is preparation is the key. Be it practice, food intake or water everything matters on the day of the race. I cannot stress enough about how important this is! I did my 3rd half marathon in India and I did not have time to prepare the day before or practice for the run and I thought it was fine for me to do it but I was wrong. I did not drink enough water, no proper carbohydrates intake the day before, I did not eat anything or even drink water on the run day before the start. And it clearly showed how bad it can get. I could not run continuously for more than 5kms and by the 15th km, I felt fainted and nauseated. I had no clue how I pushed myself to complete the full run. I sat wherever I could, it was a horrible experience. And this is when I lost confidence again and in my ability to run half marathons. I felt it wasn’t my thing but I enjoyed doing it. I used to beat myself thinking what went wrong and realized it was lack of proper practice and diet intake. For my next half marathon, I made sure I had carbs, I drank at least 5-6 liters of water, slept well for 7 hours and I finished my run in 2H45mins, which made me feel good. 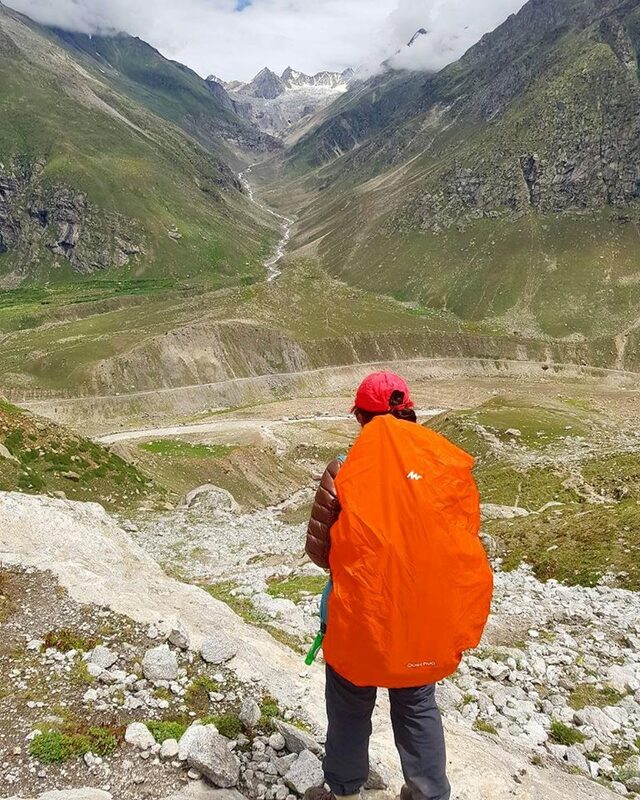 I did one major trek during this time in the Himalayas, called Hamptapass Trek. It was about 14,850ft above sea level. I can say it was not easy but I am glad I could finish it and would love to do another one sometime. You can read about my trekking experience here. I strongly believe trekking definitely played a major part in my weight loss at that point. We had to keep ourselves fit to do this trek. We were given 3 months of workout routine (cardio workout which I did at F45) to get fit for the trek. This routine helped me shed a lot of extra calories. By this time, I could feel my body lose weight. I was 51 kgs or 112 lbs at this time. This was after completing 4 half marathons, 1 trek and some functional training at (F45) and on and off gym workouts in a period of 7 months. I was back to my pre-pregnancy weight. I felt good to fit into all my old clothes, feel younger and receive compliments, but all this did not come easy. I worked hard and put a lot of effort. When people ask me how did I get back in shape, I say I worked hard for it. Few women might be fortunate not to put on weight at all after delivery, it is their body type, but for women who do put on, you can always lose weight – I am a living example. I am not saying that I am in perfect shape right now – No, I still have a flabby tummy and few extra calories, but it is fine, I still workout and will continue to run whenever possible. I feel much lighter than before after losing nearly 20 kgs after having a baby. And there were many times I used to work out without an aim to lose weight but for my mental strength. I could totally feel the difference the day I worked out. I was a happier person and could take care of Ishaan really well and do my chores actively. When I did not work out, I used to feel lethargic and not do any productive work, and just let the day pass by. It’s the same with me even now. I honestly don’t find the time or energy sometimes but I literally push myself to the gym and I am a happy person by the time I get back home again. Endorphins that generate during the work out play a major part. It is a proven theory. I have been asked many times – how I find time while taking care of my baby all by myself. Taking care of a baby is definitely one of the most exhausting jobs anyone can do, especially when you don’t have any help (I don’t think many would deny this fact). My husband works full time and he is into finance, so he doesn’t come home by 5 or 6pm. Nitin leaves at 9am and comes home by 7pm or sometimes 8pm. With Ishaan I could not wake up too early to hit the gym, so we figured out a plan. I used to keep Ishaan’s dinner ready by 7pm and had my shoes on ready to hit the gym and Nitin used to feed Ishaan while I completed my workout for the day. This way I have to give a lot of credit to my husband for supporting me by taking care of Ishaan and feeding him after his busy day at work. I feel every husband should support their wife in their weight loss if they are determined. Now Nitin is pursuing his MBA and we do not have any set timing like before. When Ishaan sleeps I put him in the stroller, take him to the gym along with me and finish my workout. I am fortunate enough that my baby naps well in the stroller too most of the times. And thanks to the amenities in the condominiums. My motivation to start running and take it up seriously was my husband and my co-sister. 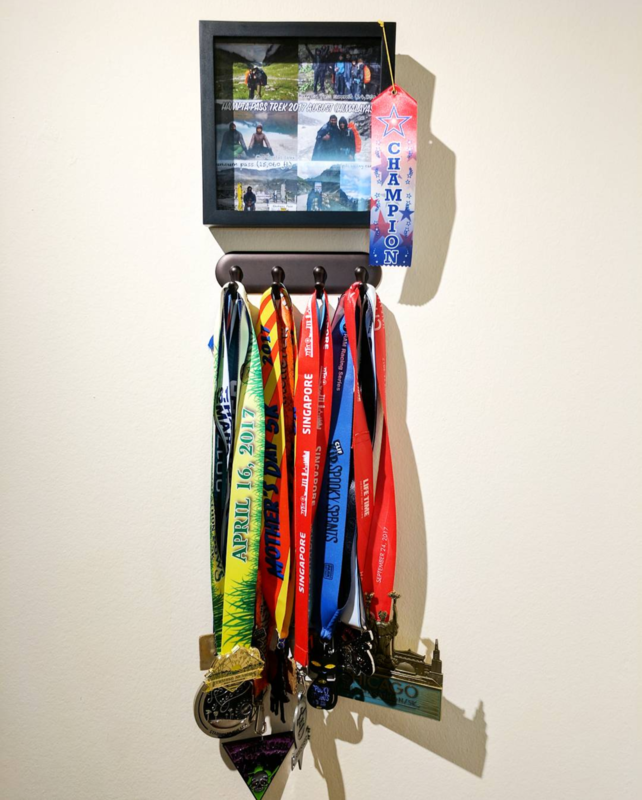 My husband ran few full marathons and my co-sister runs half marathons. Initially, I just could not understand how they did it, I felt it was insane to run that kind of distance. Honestly, I just was not convinced. But when I started doing it out of my interest and with a purpose of losing weight, I felt nice. It is more like me time for me, more of a therapy. You understand yourself more while running, you know your limits and how far you can push them. You control your mind it just feels quite rejuvenating to me. Especially when you run with a beautiful view, it feels like heaven. I thank my husband for introducing me to running. Other than running, my main motivation to stay fit is my baby Ishaan. You always want to catch up with your baby’s energy as a parent. Kids have tremendous energy levels and I don’t want to lose out on not being beside him because of the weight issue. It might not be the case for few moms but for me, it is an important factor. I see myself being more active after losing weight. Taking good care of Ishaan and playing with him which makes me feel happy in return. Trust me, this won’t come overnight or not even over months. You need to work on this every single day. If you are starting it off now, you need to have PATIENCE and DETERMINATION. It is very convenient to succumb to this whole weight issue situation and stay where you are after baby with the exhaustion levels and time constraints but imagine the problems which knock on you at a later age. Half of the health issues arise because of overweight. I believe staying fit is just not for overweight moms or only for people who are overweight, it is for everyone. It stimulates your hormones and makes you be fit. It can help you get more productive at work. 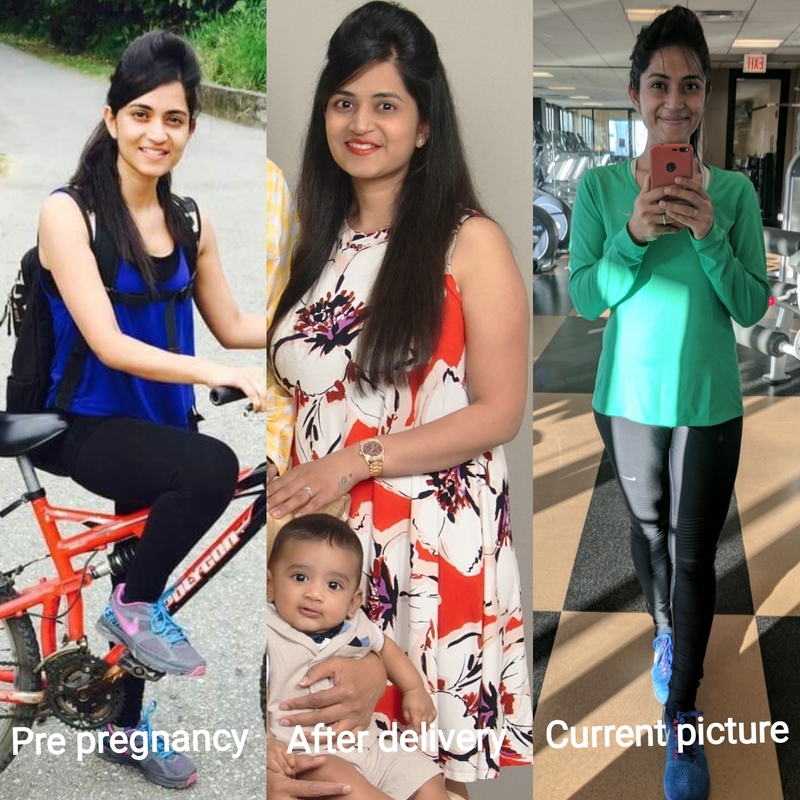 There are a lot more benefits through staying fit and doing regular exercise for everyone and not just for post-pregnancy that I am stressing in this particular post. When it came to diet I did not follow any particular diets. I do not believe in particular routine. As I mentioned earlier, I included hot water lemon and honey in my mornings on empty stomach. I gave up on rice since it made me feel bloated. I am blessed to NOT fancy sugary treats, so I am away from all the high-calorie food which is the main cause of damage to your body. Non-sugar carbs are still fine before they turn into fats, you can always work out and burn them off but be mindful when you indulge in sweets you are feeding your body direct sugars which is not very good for your body. I love biryani and I do indulge in biryani once in a while. I have adapted this way of earning my big meal. When I know I am planning on having biryani, I work out more and earn the meal so I can happily indulge in it without any guilt. This system works well for me. This way you don’t have to sacrifice anything you like to eat and eat without guilt. I never count calories when I eat I just try to eat healthily. I try to avoid fried or processed food which is very conveniently available in the US. I am a big fan of chicken. I try to add grilled chicken and egg for sure in my diet in any form. I eat quinoa as a base, I definitely need a base to finish my meal so I substitute rice with quinoa or poha sometimes. Yogurt is a good probiotic. I make sure I include that as well. 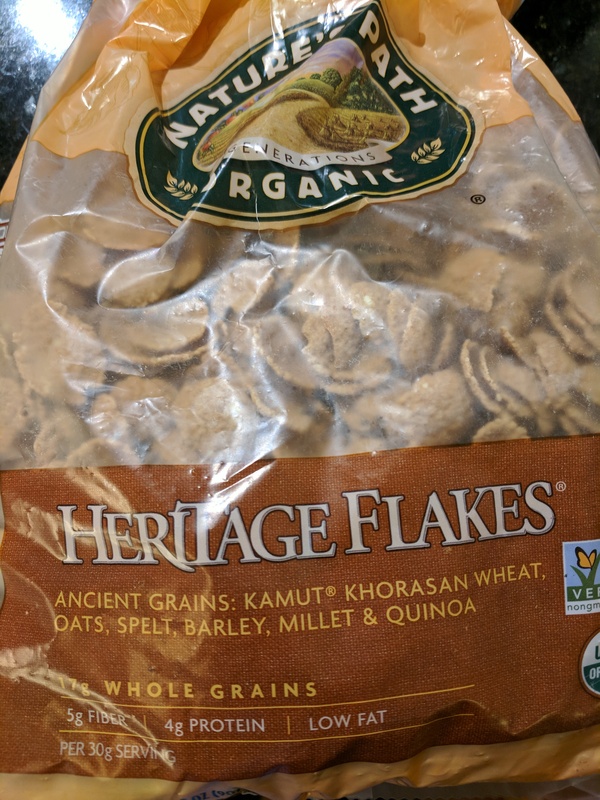 Sometimes when I don’t have the energy I eat corn flakes so these are wheat flakes with very fewer sugars and the flakes are made of many different grains (see picture). I eat raw flax seeds, which are a good source of protein and Omega 3. I don’t believe in eating too many fruits, they are carbs and sugars mostly. I try to eat salads once in a while. Sometimes roti and curry would do. Also, the key is to eat small meals every 2-3 hours. This helps you not to binge eat on anything and reduces the hunger pangs. Do not miss your breakfast, it is the most important meal of the day. Typically, Breakfast – Oats, dosa, idli, toast anything in small quantities, Snack around 11 (nuts preferably), Lunch – include chicken and egg if possible. Vegetarian options can include tofu and lentils. Evening snack – Small cup of cereals. Dinner – Roti and curry or salad. You can eat anything you want but eating in very moderate quantities should help. Small meals, in moderate quantities and working out for at least 30 mins every day should be enough to stay fit. The above is my personal experience with weight loss and I strongly believe every person can do it. It is all in our mind, your body has all the energy you need, and all you have to do is train your mind. Don’t listen to your mind, make your mind listen to you. I do not follow any particular diets because I do not like my body controlling me. I like to eat what I like with my limitations and control my body the way I like. It is just a personal thing. You will figure out your way as you start to workout. Trust me, you will be happier than you are now. Please feel free to contact me for any kind of information regarding workouts, running, trekking, food plans, and nutrition. I will be more than happy to help you within the boundaries of my knowledge. We also have a girl’s fitness Whats App group where we post our daily activities to keep each other motivated. If you are interested I can add you to it. Thank you so much for penning down your experience. Absolutely enjoyed reading through this. Very inspiring and refreshing. I am seriously inspired by yours.. Enjoyed reading.. Add me to ur WhatsApp group if u can.. Motherhood is beautiful but at the same time it’s very challenging .For me it was a life changing event where mentally and physically I have been through lot of changes. The first thing after post Pregnancy most women they lack confidence in them.Which I personally experienced. You can search ‘workout for beginners at home’ in YouTube, there are a lot of videos already designed. You can pick few of whatever you feel comfortable and keep alternating every week. You might get body pains initially but that is only because your body is not used to the routine. I would suggest you to continue working out and you will definitely find results. Truly amazing and inspiring. I have just had a baby and need all the inspiration I can get to keep moving and working. Looks like I have come to the right place.. thank you. Keep inspiring.. waiting to read more. Hi nivvi .. this is Veena .. Thanks a lot for the post .. I am truly inspired and motivated by your post.. Am on same boat .. trying to shred extra calories …I clearly know what all I need to do to shred extra calories but can’t find time and energy with my 7months old😭..but I really need to get back to my original weight to be confident… I need to workout specially for my tummy.. need to go back to my fav wardrobe. Please give me some suggestions on how to reduce tummy fat. Pleas add me to fitness Whatsapp group to get motivated everyday 😊 how can I provide my number? Way to go, Nivvi. Your dedication for fitness is motivating and inspiring.